Ethan had a funny feeling in his tummy. He had woken up that morning, wanting nothing more in the world than to make Bloops. But there was a big problem; Ethan had forgotten how! He and his little sister Livia looked at each other. Maybe Livia made Bloops? Ethan poked Livia in the arm. Suddenly, Ethan had a great idea!! He took Livia’s hand and they walked into the kitchen. Poppa had a funny feeling in his tummy. He had woken up that morning, wanting nothing more in the world than to make Bloops. But there was a big problem; Poppa had forgotten how! He and his wife Nana looked at each other. Maybe Nana made Bloops? Poppa poked Nana in the arm. “Would you like some coffee?” Nana asked. Suddenly, Poppa had a great idea! “ Yes, please!” Poppa answered. Livia was being fed in the kitchen and Ethan was helping. He scooped baby food onto a spoon and leaned forward to give her a bite. Ethan sighed. Where were the Bloops? Then he got another great idea! Poppa looked into Nana’s coffee cup. He poured cream into the top. “Plop!” The cream landed on the coffee. Now Poppa took a sugar cube, and dropped that into Nana’s coffee. “Plop!” The sugar cube landed in the coffee. Poppa sighed. What good was coffee without Bloops? And WHERE were the Bloops? Ethan took Livia outside and they stood next to a mud puddle. Ethan and Livia jumped into the puddle. “ Splash!” went their feet. Ethan was certain this puddle had Bloops. They just had to try harder. “Splash splash splash!” Livia disagreed. They stopped jumping. Where could those Bloops be? Suddenly Ethan had another great idea! Poppa walked into his workshop. He looked around the room with satisfaction. It was filled with Poppa’s BOATS. He found an unfinished Poppa’s Boat, and picked up a hammer. “Bang!” His hammer hit a nail. 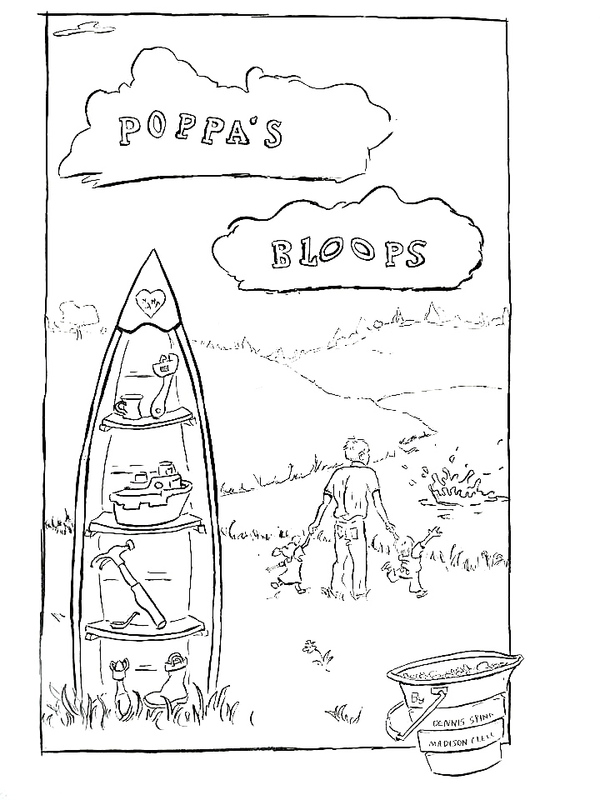 Poppa was certain that Poppa’s Boats had Poppa’s Bloops. He just had to try harder. Poppa picked up the hammer again. “Bang bang bang!” The hammer and nail disagreed. Poppa stopped hammering. Where could those Bloops be? Nana poked her head in the door. “ Could you help me with the sink?” She asked. Suddenly Poppa had another great idea! Ethan and Livia were taking their bath. Floating all around them were bath toys. Ethan picked up a bath boat and lifted it high above his head. “Ploink!” The boat hit the water. Ethan scrunched to very the back of the tub. If he pushed himself across the tub, that would make a giant wave, and surely giant waves made Bloops. Ethan scooted across the length of the tub, making an enormous wave. “Goosh!” the wave went, splashing all across the floor. Ethan and Livia dried themselves and dried the floor. Where were the Bloops? Then Ethan got another great idea! Poppa and Nana’s dripping sink barely made a sound. Sitting all around Poppa were tools. He picked up a wrench and twisted a pipe just a TINY bit the wrong way. Poppa gripped the wrench tighter, and twisted the pipe harder. “Goosh!” went the sink pipes. A wave of water rushed out of the pipes and splashed all over the floor. Poppa dried himself, and dried the floor. Where were the Bloops? Suddenly he had another great idea! Ethan thought that the best things to make Bloops were at the VERY top of those shelves. Best things have a way of hiding themselves like that. Ethan put his leg on the bottom shelf and grabbed the next highest shelf with his hands. He started to climb. “BASH BANG CLANG BIPPITY BOPPITY SMASH !! !” said Livia. For a minute it was quiet. “Okay never mind,” Ethan said. At that moment Ethan and Livia’s Mommy looked in the garage. “Why don’t we have Daddy take you to Poppa’s to play?” Mommy said. “Why don’t you go look for Bloops outside?” Nana suggested. Poppa was happy go outside, but he walked in circles with his head down. Poppa was sad too. No Bloops. Maybe not ever. Ethan and Livia were riding in Daddy’s car, happy to go to Poppa’s and Nana’s. But Ethan was sad, too. Ethan and Livia jumped out of Daddy’s car when they arrived at Poppa’s. They raced over to Poppa, who was kicking the dirt. He was glad to see them, and he lifted his head when Ethan and Livia came screeching to a halt right in front of his feet. They had stopped so fast that stones flew out of the dirt and hit Poppa’s shoes. Poppa picked a big pebble off his shoe, and helpful Ethan and Livia picked off some stones too.Clutching the stones, Poppa, Ethan, and Livia all looked at one another. “That’s it!! !” Ethan and Poppa shouted. They were so excited they picked up Livia and twirled her around and around. Livia smiled a big smile! Ethan, Livia, and Poppa started running around. Poppa grabbed a bucket, and Ethan and Livia grabbed as many stones as they could carry. The three of them put the stones in the bucket and dashed over to the pond near Poppa and Nana’s house. Each of them took a stone out of the bucket. “Bloop bloop bloop!” Livia said. Ethan, Livia, and Poppa tossed their stones in the pond. “Bloop bloop bloop!” The stones hit the water. “Hooray!! !” Ethan, Livia, and Poppa yelled. As they Blooped, a breeze picked up. Puffy clouds ambled by and reflected in the pond. Poppa, Ethan, and Livia noticed something. “I see Levi!” Poppa exclaimed. One of the puffy clouds looked just like Levi. The three Bloopers peered into the pond. “ I see more faces!” Ethan shouted. Sure enough, the reflections of puffy clouds looked EXACTLY like the Bloopers of the past! “Bloop!” Poppa yelled, and tossed his stone at a cloud that looked like Megan. Ethan, Livian, and Poppa found all of the smiling Bloopers, and gave each one a “Bloop!” for good measure. They made Bloops for a very, very long time, and they were very, very happy. Ethan, Livia, and Poppa never lost their Bloops again.